This article is the third in a series of interviews with organisers of underground metal festivals in Scotland, previously covering one of the longest running (BOBSTOCK – Bobfest 10), and one of the newest (Sonic Mass). This time around, we’re zeroing in on one of the most niche metal events to be launched in recent times, Doom Over Edinburgh. If you couldn’t guess by the title, D.O.E. is dedicated in its entirety to the genre of doom, and doom alone! If you’ve been following the other articles, you’ll notice a recurring theme when it’s mentioned that D.O.E. was put together by yet another musician, Miguel Santos. We grabbed a few precious moments with the mastermind of not only Edinburgh based doom metallers, A Dream Of Poe, but also this new yearly event. Valkyrian Music: Hi Miguel! How is life in the wake of the very first Doom Over Edinburgh? Miguel Santos: Still recovering from a cold but not too bad. Yourself? VM: Not bad at all! Are you fit talk about Doom Over Edinburgh? VM: Brilliant! Well, first of all, it’s a very defined genre. What made you choose doom specifically? VM: One might suspect that such a narrow bracket would restrict turn-out, but what were the numbers like in the end? MS: Well, it does restrict it a bit. I made a loss on this first edition, and I can’t deny that I was expecting to have more people attending the festival, but it was a loss that still allowed me to look in a positive way at the next edition. We had the cancellation from Solstice, and due to that I had to do some refunds, so that had an impact on the final number. But I believe the doom scene is great. People that like it will travel miles to come to the events. As an example, I had a german couple who flew from Frankfurt to come to the festival! That’s dedication to doom! VM: That’s pretty cool! Do you think niche genre fests can hold their own with events on a similar scale which appeal to a wider audience? MS: Of course, on a festival that appeals to not only doom but black, death, thrash and so on, the likeliness of having more people attending is huge when compared to a doom only festival. There are lots of doom only events all over the world, and they are all doing great! VM: It would be good to see another similar UK event stand shoulder to shoulder with some of them. VM: Talking of such things, a lot of new festival type events tend to book some pretty big name headliners. With the first D.O.E., you went for The Prophecy, who, although they have a substantial career behind them, aren’t hugely well known. Can you tell us a bit about that decision process? MS: The decision process is relatively simple. First of all, I try to book the bands that I like and would like to see live. Then I take into account how much it would cost me, and if the band can generate enough interest here in Scotland to cover the costs. MS: Yes absolutely, but then I do like doom as I said, so I kind of like most bands within the genre. I have my preferences, though, but I never rule out others opinions. That’s why last year I asked for suggestions from the public. I mean, at the end of the day, I need to please as many people as I can to try to cover all the costs. VM: What makes you think ‘I really have to have THAT band? MS: Well, put like that, I would say personal taste, really, but that’s way before sitting down and thinking about the costs. The Prophecy, for example, are one of my favorite bands! I was trying to get them to play in the Azores, but then the costs of that combined with the very, very small amount of people who like doom made that impossible. But then, here in Edinburgh, it was a different case, as it would be much easier and cheaper to have them on the bill. VM: New all-dayers and mini-fests seem to pop up all over the place at the drop of a hat these days. D.O.E. seemed to be getting announcements and promotion out years ago! How important was this extensive lead-up to planning the show successfully? MS: I always like to do things in advance. It gives me time to plan things ahead and be on top of everything. If something happens, I have more than enough time to react and prepare a solution. Also by starting early – I mean, a week after the end of the first edition I announced the first band for 2016 – it allows me to build up the interest and reach as many people as possible, so that way I maximize the chances of having a full house, and in that case cover all the costs. VM: With the second D.O.E. already announced, are you at all concerned that you won’t have the same amount of preparation time? MS: Well, I’m actually having more time to prepare this time. I started the last year’s edition promotion in July, I believe; this year I started in March, so it pretty much gives me 1 year to get everything ready to doom! VM: Really? It seemed like so much longer the first time! I apologise. MS: No worries at all! It did seem a long time indeed. I do hate waiting, but that’s a necessary good I believe. VM: Maybe it’s just the magic of doom? MS: Indeed it is! And good things come to those who wait. VM: Are you hoping to develop the event into a bigger and better version, or is it more or less where you want it to be? MS: I can’t deny that I want it to grow more, and become bigger and better. I do want to provide a better experience for the bands and the audience, but I’m happy where I stand now. There’s lots of room for improvement, and I’m working on that. Anyway, there’s just so much you can do. I have to take into consideration the amount of local people interested in attending a festival like Doom Over Edinburgh. So, the thing here is trying to promote it every year the best I can, get the word out so we can get to a point to have more people attending it – people from all over the UK and from mainland Europe as well. But anyway, in my opinion, 2016 is shaping up to be a great one, and an improvement of the 2015 edition. VM: I think that’s a good place to finish. Thank you very much for your time, Miguel, but before you go, there’s one more question, which is fast becoming a tradition for the end of these interviews: Do you have any closing advice for those thinking of taking on a similar event? MS: That was my pleasure, thanks very much for the opportunity! My advice would be, know your audience and listen to them, do your homework, and work at trying to be as cost efficient as you can. Be prepared to make a loss, as it can happen, but don’t give up! And don’t trust Facebook that much! 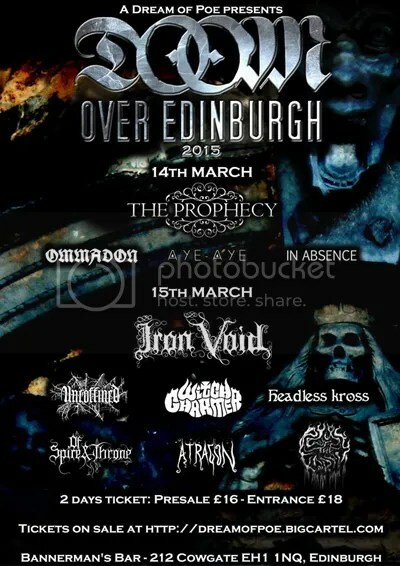 Doom Over Edinburgh II is set to take place on March 11 2016 at Bannermans Bar, Edinburgh. 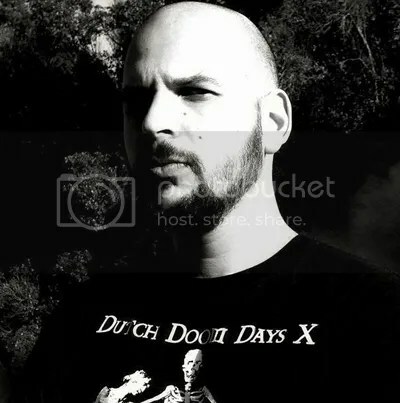 This entry was posted on 28th April 2015 at 10:30 am and is filed under Interview with tags DOE, doom festival, Doom Over Edinburgh, Edinburgh, Miguel Santos. You can follow any responses to this entry through the RSS 2.0 feed. You can leave a response, or trackback from your own site.